History: Released in 1962 by the pharmaceutical company Sterling, it has been used in the treatment of a variety of medical conditions, including osteoporosis, muscular dystrophy, muscle wasting in post-operative patients, short-stature children, and others. It is still produced today in various countries around the world. 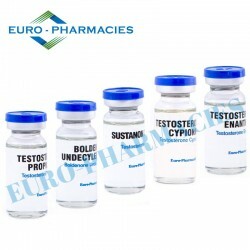 Like most other steroids which saw production in the 60’s, it rapidly made its way into the hands of BB’rs and other sportsmen, and even today, it retains a strong presence in these circles. Method of Administration: Both injectable and oral preparations of this drug are common, although the injectable version offers slightly more benefit, per mg.
Steroid Class: Stanozolol is a DHT derivative, belonging to the DHT-family of steroids. Primary Use: In the BB’ing community, Winstrol is used primarily as a cutting/pre-contest steroid, but can also be used during lean bulk cycles. It does not perform well as a mass-builder, but does a great job of building moderate amounts of lean tissue completely devoid of water retention. Combined with its ability to improve muscular hardness, density, and vascularity, it allows those with sufficiently low bodyfat to showcase the maximum in muscle detail. For individuals with higher levels of bodyfat seeking physique improvement, Winstrol is a poor choice, as many of its benefits on the musculature will be non-apparent. However, for those who currently display good condition, Winstrol can be used as a finishing touch in order to bring the physique from good to great. Winstrol is also a popular drug among individuals looking to increase muscle strength and power without a commensurate increase in bodyweight, such as the various strength athletes and sportsmen. While one should not expect strength increases on par with a drug like Anadrol, its ability to enhance strength without relying on sheer bulk is impressive. Aromatizable: No. Stanozolol is not capable of aromatizing to any degree. Standard Dosing Range and Cycle Length: Stanozolol is most commonly dosed at between 50-100 mg per day for a period of 4-8 weeks in length. Frequency of Administration: Daily use; split into 2 equally divided doses when administered orally and administered 1X daily when injected.